The efforts of African-American women in the woman suffrage movement are often overlooked, sometimes because there were not as many involved, but also because many often faced blatant discrimination from leading white suffragists. But a firm belief in the importance of the vote for black women as well as for white inspired many to work tirelessly for its achievement, despite the challenges. Mary Church Terrell was born in Memphis, Tennessee, September 23, 1863 to Louisa Ayers and Robert Reed Church, both former slaves. After emancipation Mary’s mother opened a hair salon in Memphis, and her father invested in real estate; the success of both endeavors would enable Mary to attend college and enter the teaching profession. She left teaching when she married Robert Terrell in 1891; the couple had two daughters. Mary enjoyed a busy and active life, raising her children and managing her household. She was drawn into public life by the outrage of a public lynching of a friend in 1892, and that year became president of the Colored Woman’s League, which later became the National Association of Colored Women. 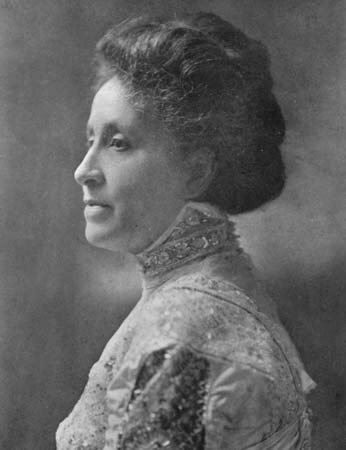 Mary assumed the presidency of that organization as well, and spent many years fighting for equal rights in the criminal justice system, beneficial work opportunities, and suffrage for both black and white women. Discrimination from white suffragists was subtle, but keenly felt. During the famous march in Washington DC in March, 1913, black suffragists were asked to walk in the back of the parade to avoid angering southern supporters. Mary and her group reluctantly agreed, but another black leader, Ida Wells Barnett, flatly refused, and joined the parade in the middle with the white marchers, which inspired other black suffragists to do likewise. Mary was one of the few African-American suffragists to picket the White House in 1917 with Alice Paul and the Congressional Union. After the amendment passed in 1920 she continued her work of community activism well into the 20th century, including working against segregation in the south. She was the first black woman appointed to the District of Columbia Board of Education, and lived to see the Supreme Court decision, Brown vs. the Board of Education, which ended school segregation in 1954. She died later that year. Mary Church Terrell spent much of her life advocating for equality for all women. Her autobiography, A Colored Woman In a White World, published in 1940 offers a first-hand view of the challenges she faced and the courage she showed in overcoming adversity and improving the lives of all women. Happy Birthday, Mary Church Terrell!